During the beautiful sunny afternoon of November 7, 2018, Merida Grace Fowler passed away surrounded by love and family. Merida was born to Danish immigrants, Chris & Lulu Beck on October 11, 1927 in Mawer, Saskatchewan. She and her five siblings (Vic, Stan, John, Ed and Norm) grew up on the family homestead just outside of Mawer, where they were exposed to the rigors and benefits of country life through the great depression and Wold War II. Merida left home after grade 12 to attend teachers college and began teaching in Saskatchewan soon after. Throughout her young life, Merida traveled the world with a rambling spirit that would light in her eyes every time she relayed her adventures. Her independent nature and love of travel transcended social norms of the times. In the 1950’s, she moved to Alberta to teach school near Camrose. Soon after she came to Edson in her mint green Volkswagen Beetle where she taught at A.H. Dakin. It is in Edson where she met the love of her life, Tommy Fowler – who was the only other owner of a Volkswagen Beetle in town – and they were married in 1959. Tommy and Merida raised four children: Tom, Peggy, Marion and Kirk, and ran several businesses around Edson, including the Edson Drive-in and Nova Theatre. They treasured their community, and supported the town in many different ways such as donating the land for Kinsmen Park. In 1962, they suffered the devastation of losing baby Lorna Jean. Merida suffered another blow in 1978 when she lost Tommy to cancer and soon after battled cancer herself. However, being the strong minded woman that she was, she took on the role of single parent while carrying on with the family businesses. Merida enjoyed watching her family grow with the arrival of each new grandchild, and continued to travel near and far with the many close friends and family she held dear. Merida was a member of the Hospital Auxiliary for many years, and was a huge proponent of volunteerism. 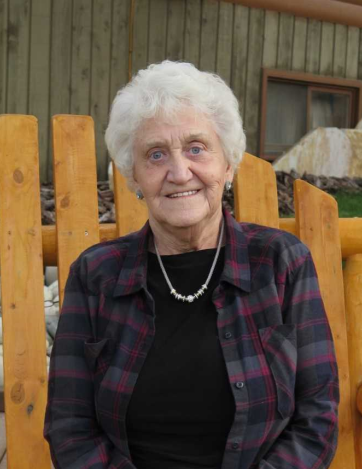 She always enjoyed ferrying the “older gals” around; whether it was to see the Christmas lights in town, attend the local church, grab a drink in Robb, or go to the Casino in Whitecourt. In her golden years, Merida took great pride in her great-grandchildren and continued to be an advocate for projects near to her heart such as Wilmore Park. She was a consummate baseball and curling fan, and a supporter of the arts; from Broadway shows to children’s concerts. Merida passed away peacefully in anticipation of her reunion with those she loved that had predeceased her. As per her wishes, no formal service will be held. In lieu of floral tributes, she had requested donations be made to the Cross Cancer Institue (11560 University Ave, Edmonton, AB T6G 1Z2) or to the Parkland Lodge Furniture Fund (4716 – 5th Ave., Edson, AB T7E 1S8).